Would you let the SmartGuide robot control you? A Smart Showroom has opened in Japan, which shows off how a building could effectively be run by robots. Created by the Shimizu Corp and Yaskawa Electric Corp, the showroom demonstrates new and innovative ways robot technologies can be used in creating 'intelligent buildings'. 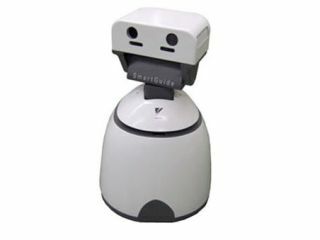 The showroom has its very own guide robots, called SmartGuides. These robots take care of the reception, say goodbye to visitors and are on-hand to answer any questions visitors may have about the exhibit. The exhibit is one big showcase for the Smart Robotics Building project. This building will soon be erected in Japan and will be overrun by SmartGuides. These robots will be part of the building's infrastructure and will be in control of maintenance, interact with people and also help with the telephones. There's no word on when the building will be built, but for us folks at TechRadar who hate interacting with other human beings, the sooner the better.